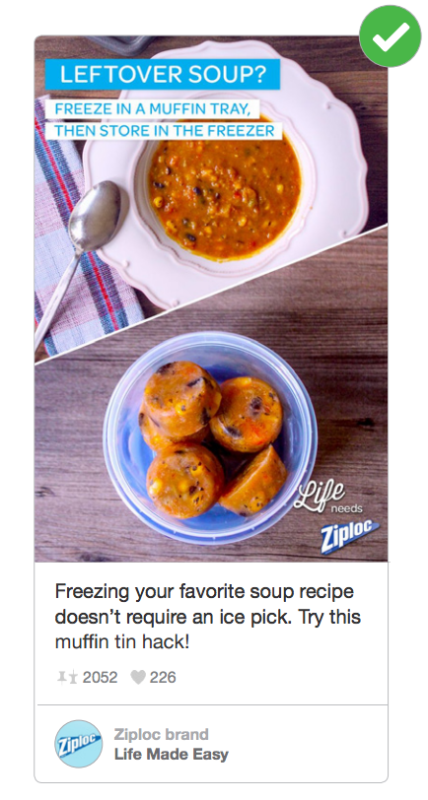 Is your brand—personal or professional—on Pinterest? Seventy million people are, with a large number of those being bloggers, companies, brands, and businesses. The opportunities to expand your reach and meet your audience are many on Pinterest, and they come in many unique ways. Though falling under the umbrella of social media marketing, Pinterest has its own special notes and best practices that help make it an extremely fun, exciting place to test, iterate, and add value to those on the network. We’re quite new into our Pinterest marketing strategies, and we’re keen to keep improving what we pin and share so that our followers find things as useful and helpful as can be. 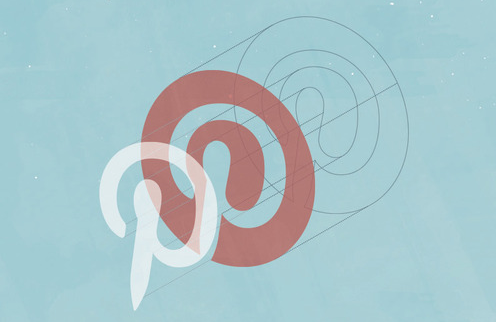 We’re grateful for the large amount of Pinterest marketing tips out there. We aimed to try them all. Here’s what worked for us. … and which ones worked best! We’re happy to share the full list and results from our Pinterest experiments. I’ve added lots more detail to each category below. Here’s a quick look at the strategies that worked best for us! And here are all the different Pinterest marketing tips we tried. Perhaps the best change we’ve made to our Pinterest engagement of late is to pin more often. We’ve gone from pinning once or twice a day to pinning 10 times per day. As a result, we’ve seen 150 percent more engagement on Pinterest. Courtney did some amazing research to dig up the recommended best frequencies for pinning. She found that a schedule between five and 30 pins per day is best. Scheduling ahead of time has made things infinitely easier for us. We can go through batches of finding and discovering great content to share with our Pinterest friends, and we can place it into a schedule so that it’s spaced out over a few days. This helps with a consistent volume of Pinterest content to share. Spacing out your pins is hugely helpful for your audience. Instead of folks seeing 10 pins all in a row from us about social media tips, these pins can arrive at Pinterest in a queued schedule, over time, to avoid any bursts of content. 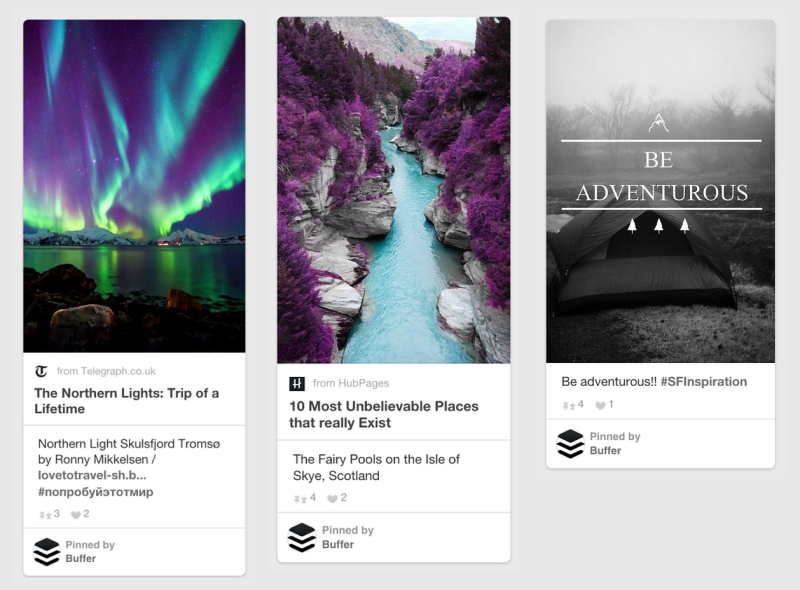 We’re so honored to be able to assist Pinterest users with scheduling pins through Buffer. You can connect any number of Pinterest accounts on our Awesome ($10/month) and Business plans, or try Pinterest and Buffer for seven days free to get a taste of how it feels. 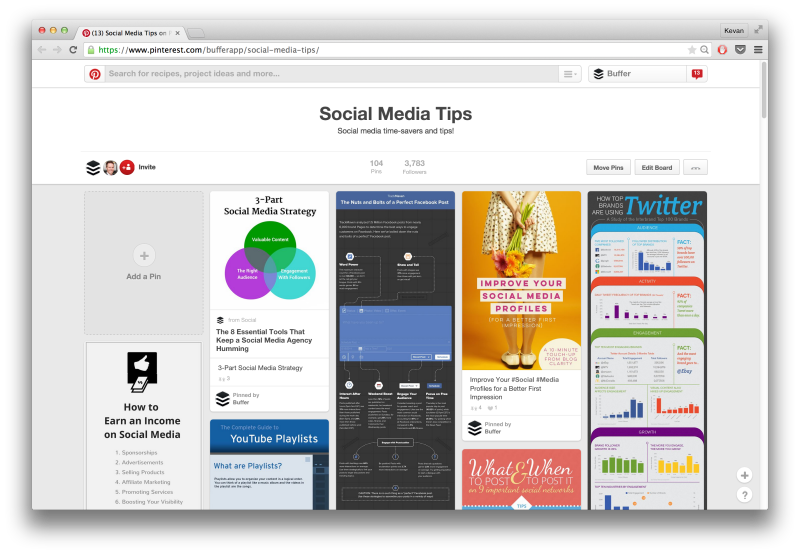 Schedule your first pin: Get started for free with Buffer for Pinterest! 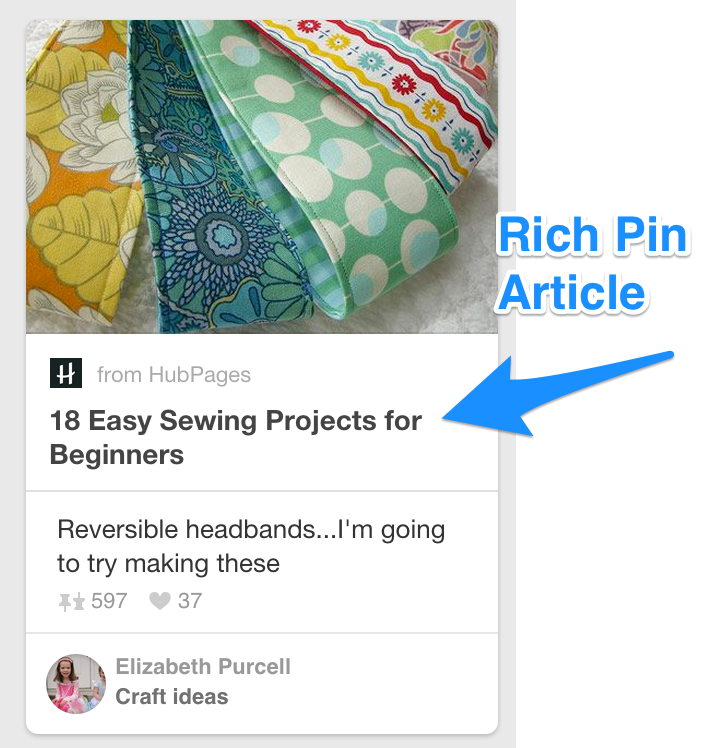 Rich pins are a free Pinterest feature intended to add greater detail and information on the pins themselves. Think of them as Twitter Cards or the Facebook open graph. They’re designed to make the pinning experience better for pinners and more beneficial for those being pinned. Rich pins appear for validated sites. Validation does not happen automatically. You can apply to add rich pins from your own website after checking to see that all the right code is in place. Add the Pinterest code to your blog. We use the WordPress plugin Yoast SEO, which includes a setting for adding a Pinterest meta tag. We copied and pasted the code from Pinterest into this Yoast setting. Validate your site at Pinterest. Click this link to use Pinterest’s validation tool, which will show you a preview of your pin. Request Rich Pins. From the Pinterest validation tool, you can click to apply for Rich Pins for your website. 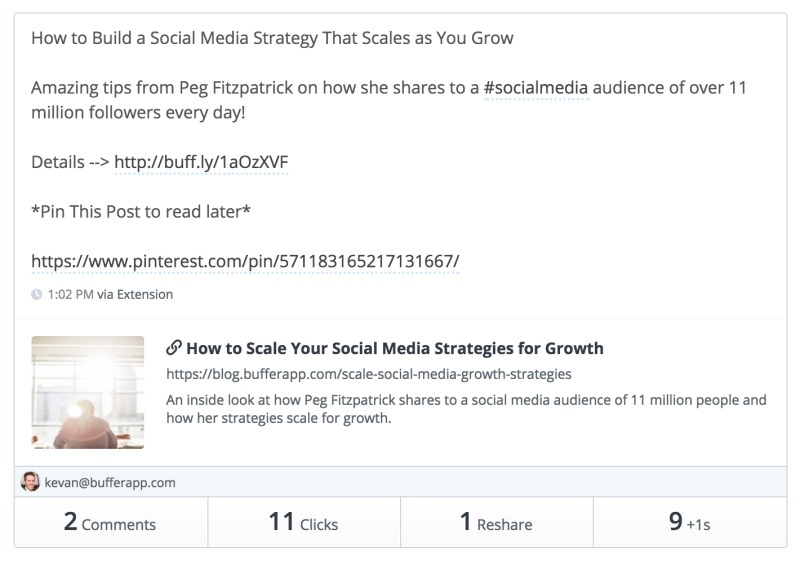 After stepping through this process, the pins from the Buffer blog—all present and past pins—now include Rich Pin information like headline, author, story description, and link. As for the effect on engagement, our Rich Pins validation happened on April 7, and since then, we have averaged 189 clicks per day from Pinterest to our blog. In the three weeks prior to April 7, we averaged 85 clicks per day. That’s a gain of 104 clicks per day—a 2x increase—with Rich Pins. 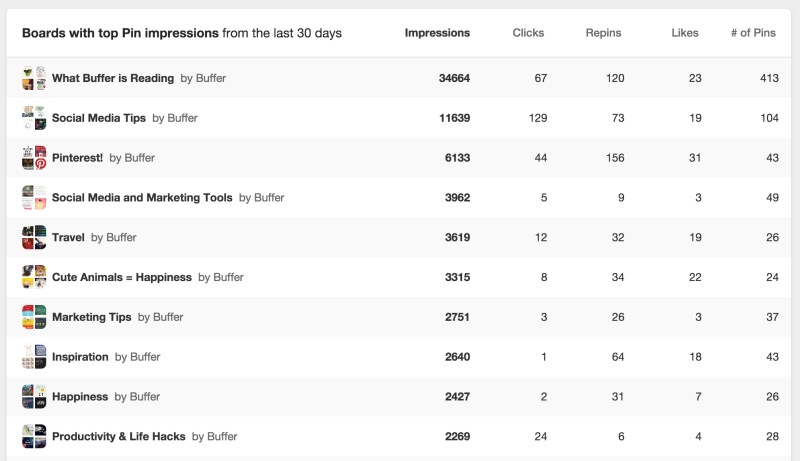 Here’s a look at the past 30 days of click activity on Buffer blog pins on Pinterest. Since early April, we have averaged more than 100 clicks per day to our website, a benchmark we were only able to reach previously in spikes and outliers. 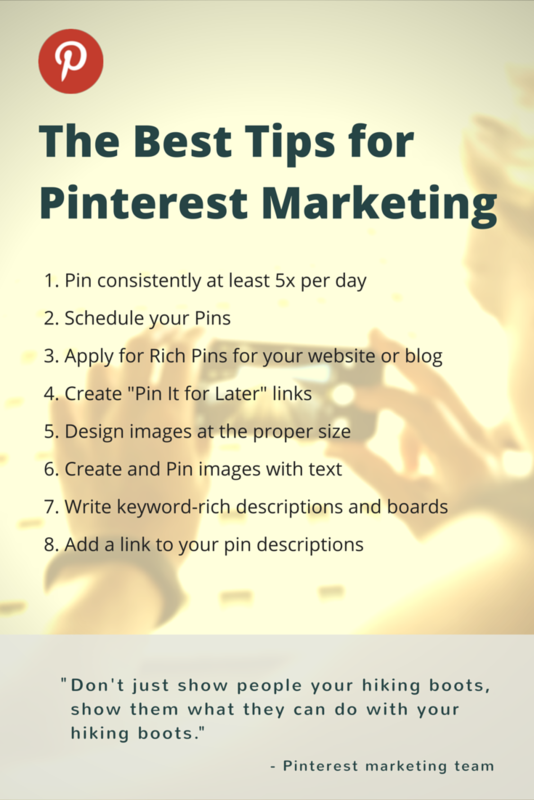 Rich Pins has played a key role here, I believe, along with an increase in posting frequency to Pinterest. Pinterest’s business blog shares a lot of great strategies and tips in its videos and downloads. Here’s one that’s super interesting and actionable. The best aspect ratio for Pinterest images is 2:3 or 1:3.5, with a minimum width of 600 pixels. Pins look best when they’re vertically oriented. Pins get cut off in feeds if the ratio is greater than 1:3.5 so make sure the image isn’t too tall. For example, an image that is 600px wide should be between 900px and 2100px tall. What is aspect ratio? It’s how the width and the height of an image relate to one another. So how do you create these Pinterest-perfect images? You can create the image from scratch, building a new image with specific dimensions and aspect ratios in PhotoShop or Gimp. If you prefer an online tool, you can grab something simple like Canva, which comes with premade templates for Pinterest that are 735 pixels wide by 1,102 pixels tall (a 2:3 aspect ratio). With this Pinterest tip in mind, we aimed to create at least one Pinterest-optimized image for each of our new blog posts (we used Canva for this). The results: We saw a couple of images spread quite far! 27 best copywriting formulas – An oldie but a goodie, we created this one several months back as a Pinterest-sized graphic. It popped up again in our top pins from the past 30 days—80 repins from multiple pinners. Many of the other images we made didn’t quite reach the top of our analytics for the past 30 days. It’s perhaps notable that the one that did—How to Share a Blog Post—was the most recent one we made. Hopefully this means we’re improving! From the video above, the Pinterest team shares 5 keys to what it’s found to be most valuable in writing up the descriptions of your pins. Give the reader something to do. If there’s an action they can take, share the next steps and add a link to somewhere useful. No references to Pinterest functionality (“Click here to pin!”). While only about 75-100 characters of your description will appear in grid view, you can include up to 500 and they’ll all appear when people click to see the Pin close-up. Generally speaking, more characters mean more helpful details and more opportunities to show up in search results. This all seemed like great advice to test and see. We went through each of the bullets here, both in the general tips and the specific best practices. And a quick note: As we’re looking to grow our Pinterest presence, a lot of our stats from the Buffer Pinterest profile can appear quite low. Three or more repins per post is super for us! This could mean a lot of variability in the results we’ve observed—you may see different outcomes for your profile. Hopefully you can still gain a bit of insight and direction from our learnings! Looking at our stats for Repins, likes, and comments, our top pins were those with a short description, 100 characters or fewer. Our longer pins found much less engagement overall in the past few weeks. One thing to consider here: Longer, keyword-rich descriptions are valuable for being found via search, which can extend the life of a pin. It could be the case that these keyword-rich pins of ours will continue to see engagement further out into the future. The general best practice seems to be that no hashtags is best. The majority of our posts did not include hashtags. We didn’t observe a significant fall or rise in engagement when we did use hashtags. Some posts with hashtags were among our most engaged, the majority were not. It didn’t seem that hashtags played a significant role in an increase in engagement for any of our pins. Pinterest does an amazing job of giving its visitors places to click for more information. The source of a pin is clickable, and if Rich Pins have been validated, the Rich Pin info also provides a fast and easy place to click. We included shortened buff.ly links into the descriptions of our pins. 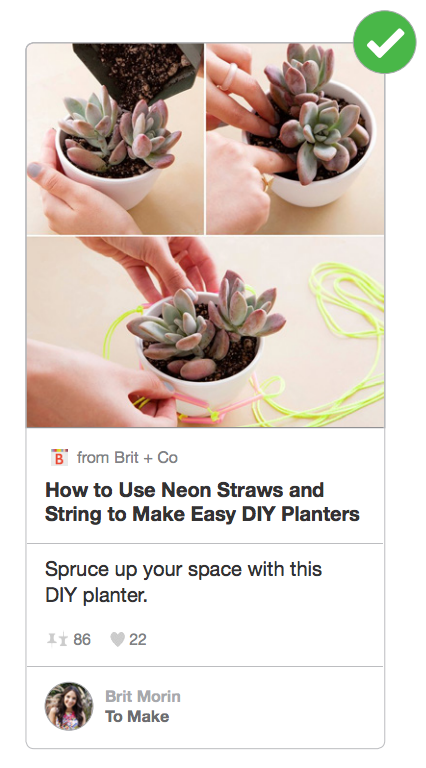 Pinterest makes these links bold in the description, which could potentially add a small visually-compelling aspect to the pin. Have you ever noticed some popular posts on Pinterest that seem to be mosaics? This multiple-image strategy is one that many have used to great success with DIY posts and how to guides. You place multiple images into one, creating a single image that can be pinned. Best practices with multi-image mosaics are to use four or fewer separate images in your mega image. Canva templates work really well for putting something like this together. One of the interesting things for us when tried out this tactic is finding out how well this might fit with our content and niche. We write about social media tips, not home improvement, beauty, cooking, etc. Will our tutorials work as multi-image Pins? 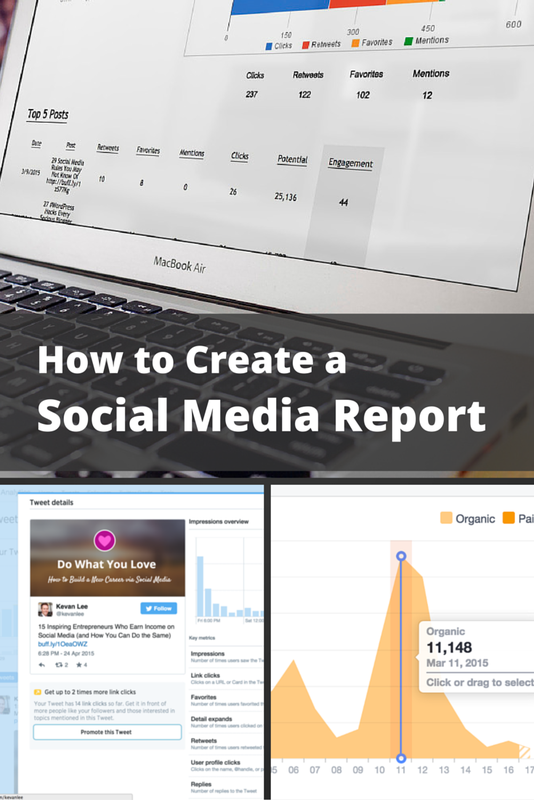 We created a mosaic image for a recent blog post, and that image received 7 repins, more than double the average for a typical pin from the Buffer blog. For how we went about creating these multi-images, we used a Canva template for the Pinterest-sized graphic (735 pixels wide by 1,102 pixels tall). 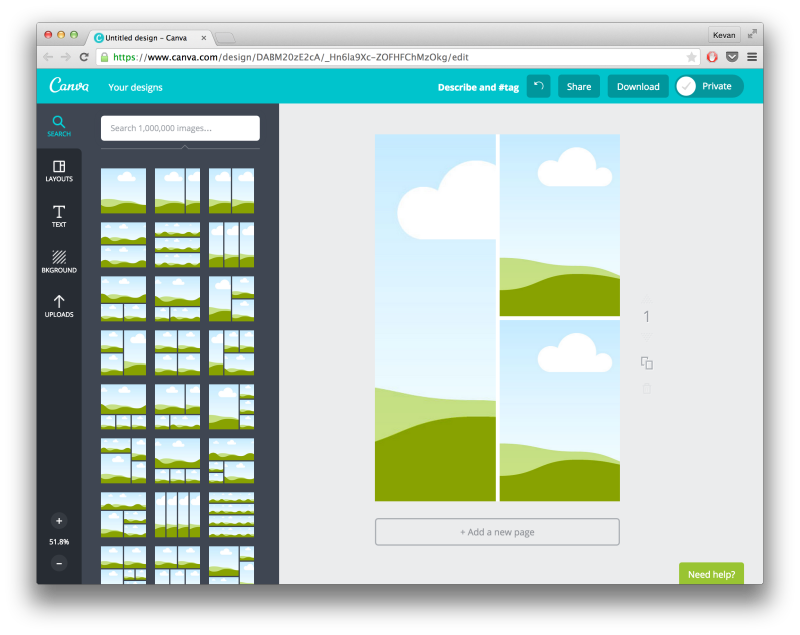 Then we added a Grid to the template and pulled in images we had created previously for the post. Many pins you’ll find on Pinterest have a text overlay on top of the image—a headline or description referencing the full article or pin. To create something with a text overlay, again you can use a program like Photoshop or Gimp or an online tool like Canva. The Nester has a great tutorial on how to create Pins with text in them. One of the best tips: Test the legibility of your images before you publish. I wanted to make sure the graphic at the top of this post was Pinterest friendly just in case anyone pins it so, I put the post in preview and quickly pinned the graphic just to test it to see if it was legible in the small photo that you see at the Pinterest site. The majority of the images we pin include text—infographics, blog graphics, book covers, etc. One of our boards that includes less text is our Travel board. Pins with text have been our most significant sources of engagement. This could very well be unique to our niche also. We share a lot of inspiring quotes, infographics, and headlines. What have you observed with your pins? This cool tip from Peg Fitzpatrick and others uses Pinterest as a read-it-later blogging tool. 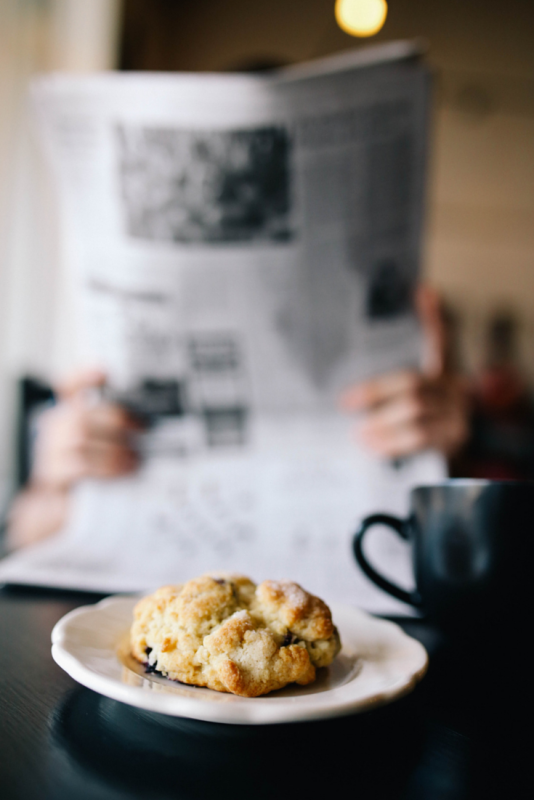 When sharing a new blog post to social media, you can give readers the option to “read-it-later.” They can then pin your blog post to a special “read-it-later” Pinterest board full of articles, giving your audience a new, easy way to catch up on your content. After publishing a new article, we pinned an image from the new blog post. We grabbed the URL for the Pin. The idea, then, is that the reader will add your Pin to one of their Pinterest boards and return to your content at a later time when they might be able to read and engage. We tried this out with a handful of Google+ posts, adding a “Pin It for Later” link at the end. In our case, we noticed some higher engagement both on Google+ and on Pinterest with this strategy. For example, this post about How to Scale Your Social Media Strategies received above average clicks on Google+, and the Pin we included in the post was repinned five times, an above average result for our Pinterest page! Does it make a difference if your board has a keyword-rich title or description? In particular, keywords are said to be useful when creating a board of your blog posts, for instance we might use words like “social media,” “marketing,” and “Twitter” on a board of Buffer blog posts. People can find your content more easily if the board itself is optimized with the keywords and phrases that you often blog about. We were interested to test this out, so we looked at two variations of boards to see what kind of impact the keyword element had on a board’s overall engagement and followers. Here’s a look at our 10 most popular boards over the past 30 days (we have 17 boards total). For our blog posts in particular, we tend to split them into a trio of boards:Social Media and Marketing Tools, Social Media Tips, and Marketing Tips. Of these, the Marketing Tips board has the most keyword-friendly description with terms like “content marketing” and “email marketing.” Yet this board gets the fewest impressions of the three (perhaps because of the size of audience/interest for those keywords, perhaps because we’re more active on other boards). Ultimately, the keyword focus for boards is one we’d love to explore more. Results thus far are a bit inconclusive. Here are a handful of extra Pinterest marketing tips we’re keen to test out and try. Have some of these worked for you? Categorize your boards. This will make your pins more easily found and will potentially result in more people following you. Find popular group boards via PinGroupie and contribute to these communities. Check your Pinterest stats regularly to see the pins from your website and the performance of your pins and boards. Avoid adding borders or other alterations (like rounded corners) to Pins. Increase brightness and saturation before pinning. 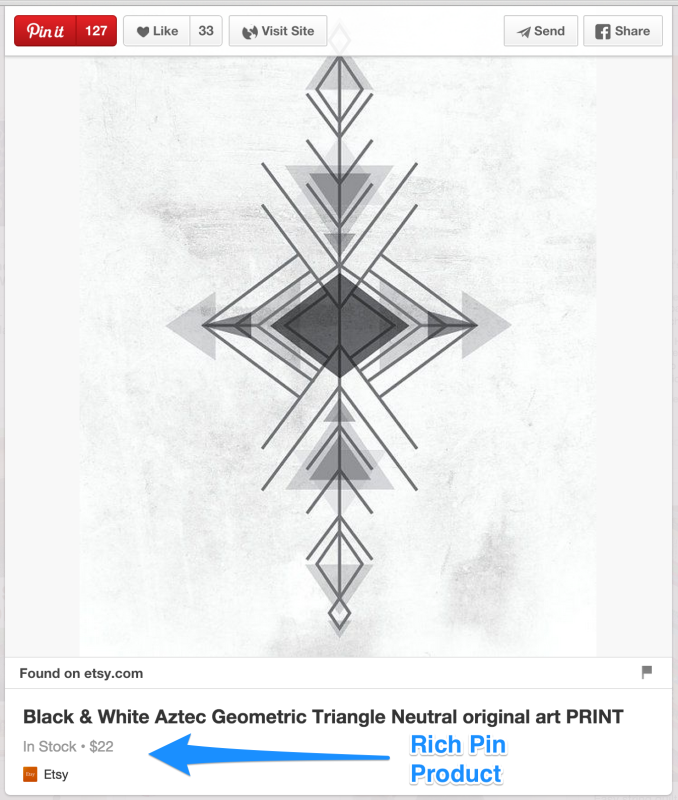 Pinterest darkens images slightly when they’re pinned. Add a subtle logo or brand name to the bottom corner of the images you create. Use Pinterest’s “Like” as a place to store ideas or potential repins. Follow individual boards for specific topics. Verify your website domain and include a link in your bio. Link your Pinterest account to Facebook and Twitter. Invite contributors to pin to a board with you. Don’t just show people your hiking boots, show them what they can do with your hiking boots. Which Pinterest strategies have worked for you? Are you early to Pinterest (like us!) or have you built a large following there? It’d be so neat to hear your perspective as well as any thoughts our experiments bring up for you. Ours is likely to be a unique experience based on our audience and niche. I’d love to know if you think these strategies might work for you, too!